Save time and prevent water spots with the Blue Perl Microfiber Drying Towel! 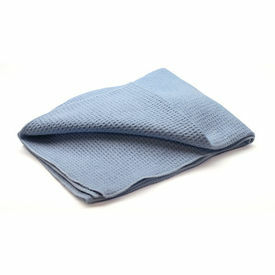 Our Blue Perl Waffle Weave Microfiber Drying Towels are big, soft, easy-to-use and very gentle on your car’s paint. We use a very soft waffle weave microfiber that’s bound and can’t scratch your car’s paint. It has a tufted, high pile loop that’s woven from an 80/20 blend of polyester and polyamide microfiber. The tufted waffle pattern makes this towel 100% scratch-free on even the most delicate car finishes, including black and clear coats! The light weight fabric used in Blue Perl Microfiber Drying Towel absorbs water fast… like lightning! The super-soft fabric also guarantees drying without creating swirl marks. This towel is easy to wring out and continues to work absolutely streak-free, even when damp. Wash vehicle with favorite car wash soap. After rinsing, dry with Blue Perl Microfiber Drying Towel. Ensure all areas are dry to help prevent water spotting. Wash Blue Perl Microfiber Drying Towel after use. Use Sonus Wash to retain the integrity of all your microfiber towels and applicators. Note: Dries vehicles quickly and easily. Product Description Save time and prevent water spots with the Blue Perl Microfiber Drying Towel! Our Blue Perl Waffle Weave Microfiber Drying Towels are big, soft, easy-to-use and very gentle on your car’s paint. We use a very soft waffle weave microfiber that’s bound and can’t scratch your car’s paint. It has a tufted, high pile loop that’s woven from an 80/20 blend of polyester and polyamide microfiber. The tufted waffle pattern makes this towel 100% scratch-free on even the most delicate car finishes, including black and clear coats! The light weight fabric used in Blue Perl Microfiber Drying Towel absorbs water fast… like lightning! The super-soft fabric also guarantees drying without creating swirl marks. This towel is easy to wring out and continues to work absolutely streak-free, even when damp. Key Benefits Extra large microfiber drying towel Tufted waffle weave for streak-free and scratch-free drying Absorbs up to 3 times the water of terry towels Instructions Wash vehicle with favorite car wash soap. After rinsing, dry with Blue Perl Microfiber Drying Towel. Ensure all areas are dry to help prevent water spotting. Wash Blue Perl Microfiber Drying Towel after use. Use Sonus Wash to retain the integrity of all your microfiber towels and applicators. Note: Dries vehicles quickly and easily.